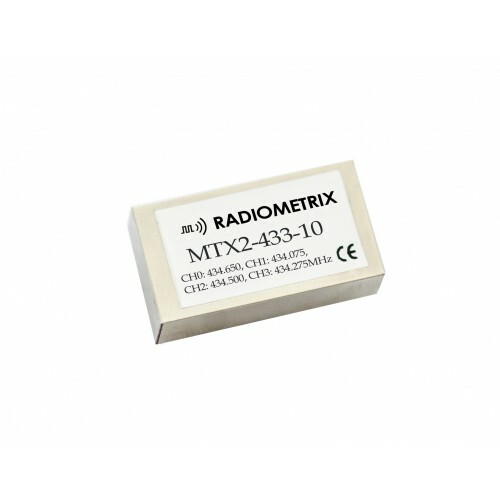 he Radiometrix MTX2 434Mhz Radio Module is a frequency agile 434Mhz 10mW radio module. Similar to the NTX2B-FA but much smaller. The MTX2 can be used in any circuit the original NTX2/NTX2B was used in (although the pin spacing is different). This unit features a TCXO for extra frequency stability plus frequency agility. The MTX2 allows selection of channels via a serial connection to the EN pin, additionally four fixed channels can also be selected via the parallel pins. The EN pin can still be used to turn the device on and off. This module is suitable for license exempt (in Europe) giving out a maximum power of 10mW. The module family is well proven in the HAB field recording reception distances in excess of 500Km. Radiometrix are understandably unable to offer technical support on these modules when used in high altitude ballooning therefore please direct all technical support queries regarding the operation of these modules to Uputronics directly. Offical Radiometrix Datasheet is here.